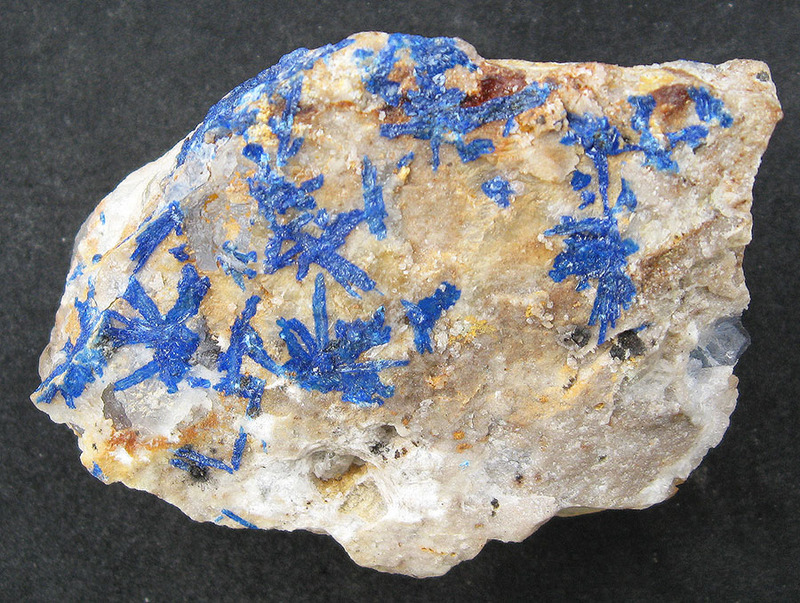 Linarite is somewhat rare mineral with an intense deep blue color. It is a combined copper lead sulfate hydroxide mineral, which is made of up flat (monoclinic) crystals that are soft (hardness of only 2). The specimen shown here is one that I collected back in 1964, when I was an undergraduate geology student. The specimen is from the world famous Blanchard Claims in the Hansonburg Mining District, Sierra Oscura Mountains, south of Bingham, New Mexico. When I visited the site, Ora Blanchard was the caretaker. I remember her as a very colorful character. She did not take kindly to thieves trying to sneak onto her property. She wore a pistol, and she also had a flock of geese to serve as "watch dogs." Mrs. Blanchard allowed me to collect in the famous Royal Flush mine. The linearite crystals occurred with galena, aquamarine-colored fluorite, bladed barite, and druzy quartz, among with many other minerals. The rock matrix is the Pennsylvanian-age Madera Limestone, which was invaded by hydrothermal fluids (about 200°C) emanating from the nearby Rio Grande Rift. Supersaturated fluids moved along any open space and deposited beautiful crystals of the minerals, including linarite.